Last Year's Resolutions - How Did I Do? So, time for me to look at my stitching goals for last year and see how I did. 1.Stitch for 15 minutes a day - every day. This is the best goal I ever set for myself and has kept me on track more than anything else I have done. If you stitch for 15 minutes every day (yes, set a timer!) you will likely keep stitching longer on a lot of days. Even if you don't, you will be stitching 1-3/4 hours a week which isn't too shabby. Also, and most important, I know that if I don't stitch today, I likely won't stitch tomorrow and before I know it the trend snowballs and I'm not going to be stitching at all. This continues to be a challenge but I think I do a bit better each year. Still not happening every day but when it does, it is good. Can't recommend this one enough! 2.Blog regularly. I fell down on this hopelessly this year and as a result only a couple of diehards are still reading my blog - thank you both of you! lol If I post what I am stitching I can see that I am accomplishing something and that is all good. It is another tool to keep me going which can be difficult as I cycle in and out of the depressed state which is par for the course for me. 78 blog posts this year so far - still pretty bad but up from the previous year at 58 posts. Have to find more time to stitch so I have more to write about. One show or exhibition this year! Doesn't have to be big (it won't be) but something to get me out there at least locally. It doesn't have to crazy quilting either - just some sort of art or craft. I am dabbling more now with other things which is fun and helps to get all the stash under control! I was artist of the month at Vulcan County one month this year and had a great time yarn bombing the county office and town. Write at least two articles and submit them for publication. It's another way to get yourself out there and the research is good discipline. Lord knows I need discipline! lol Once again, I don't expect to get two pieces published, but I would like to at least write them and submit them - that is the goal. Actually had three articles accepted this year and two of them have been published already. Start taking EAC correspondence courses with the goal of getting my Teacher's Certification from EAC. This will be long and drawn out - there are quite a few courses needed but this year I will actually start! We'll see how far I get. My husband reminded me of this last night and I will order the first class today sometime and get going. On a similar note, I would like to get back into teaching stitching which means getting some teaching proposals organized and getting them submitted in time for fall deadlines. I taught two mini-workshops at the Calgary guild and am putting together some proposals to get out there for teaching this year. This year I am going to aim at entering at least two competitions with my stitching. Not as ambitious as my related goals in other years but for the queen of procrastination it might be more realistic. I entered a beaded bracelet this year in the EAC Beaded Jewelery Challenge and snagged 3rd place. Also entered a couple pieces in the Calgary Exhibition and Stampede - got a ribbon for one of them. One item made and donated to charity each month. This will be more difficult now that AAQI is over and done with. I have been making them little art quilts for some time now and it was a charity that was a perfect fit for me. Expanding to other forms of stitching and crafts will make it a bit easier to accomplish though. Not good at all! I still have not found a niche for my charity stitching now that AAQI has closed down. Did manage a donation to the school auction next door, some stitching fabric to the Youth Embroiderers and a large donation of stitching books to the library in Milo. I donated a piece to the EAC auction as well and numerous items to the charity raffle at CGNFA but all in all, I need to do more. You get from something the amount you put into it so I will continue to try to "pay back? 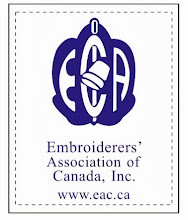 through my involvement in The Embroiderers' Association of Canada, the new EAC Virtual Threads cyber chapter and The Calgary Guild of Needle and Fibre Arts. I am toying with the ultimate payback - teaching youth to stitch. This is pretty scary for me to contemplate - the ultimate commitment because you can't go around letting kids down once you commit. I will continue to mull this one around in my mind though and see where it takes me. 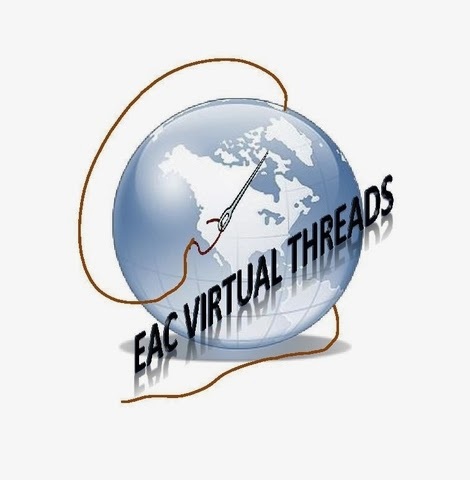 I continue my involvement with the EAC board as Prairie Pacific Regional Director and sitting on the board, doing Archives and Workshops now at the Calgary Guild of Needle & Fibre Arts, and doing another term as President of EAC Virtual Threads. I put the offer out there to teach stitching to the kids next door at the school but they weren't interested. Will look around for another venue for that. Joined another stitching group in Okotoks and they are a nice bunch of ladies to sit and stitch with. This next one is totally predictable - "the room". I will take up a seam ripper and get in there and get it organized and under control so I can work. Right now it is just the biggest stash closet imaginable! I am actually starting organizing the room at present. I have dragged all my stash to one location in the adjacent room and have started sorting through it. I hope to be able to stitch in there in the new year. This year has been a challenge. I did not go work at the lake this year but the much anticipated extra time did not materialize. I went overboard on the garden and bit off more than I could chew which meant I actually wasted a lot of time there. In September my son moved back in with his family and although I enjoy having them here, it is actually a lot of extra work - I seem to spend all my time in the kitchen or doing housework. All in all, not bad and I am looking forward to setting some more goals for 2015. Has anyone else made any stitching goals for his year? 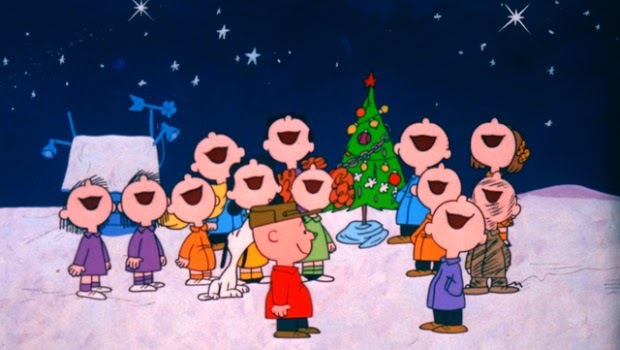 Wishing everyone a very Merry Christmas and all the best of everything in 20`15 - may it be your best year yet! 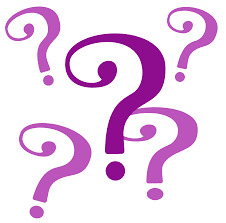 So, where has this blogger been? On a series of computer misadventures unfortunately. First my trusty old computer died and I had to buy a new one. Got it set up and couldn't get online so after a number of unsatisfactory calls to internet support people, finally they determined that it was a problem with their equipment and they sent someone out... eventually. Last but not least, I had to purchase a new modem and router. I am finally back online now and hopefully will get back to posting in the next day or so. I received my last ornament from this year's exchanges in the mail yesterday. This one is from the EAC Virtual Threads exchange and is from Betty - an adorable little snowman all ready for a snowball fight! This one is going on the tree today! So, did you think I had stopped working on the Ecuador block? Wrong! lol As usual, I have painted myself into a bit of a corner. I have done this in the past with french knots (millions and millions of french knots) and this time it is bullion stitch. But, I am stitching away and will continue to post updates! Did I mention I decided to make the llama BIG? roflol - if you are going to go crazy making bullions, why not billions of bullions?! Upcycled Cross Stitch, Another Gift Bag! I am still having great fun with this tutorial for Christmas gift bags from So Sew Easy. For this one, I started out with a piece of cross stitch I rescued from the thrift store - all this work being sold for fifty cents! Some people really don't appreciate the value of needlework. Even if not everyone appreciates the love and work in embroidery, I do, and was happy to upcycle this hooped design into my next gift bag. I used buttonhole stitch to attach the embroidery to the front piece for the gift bag I was making and then continued the assembly according to the tutorial. The back was just plain although there is a strip of contrast on the top of the back and front sections.. The inside and handles are another contrasting fabric as well. I just love how it turned out. This will hold my gift for the gift exchange at my local stitching guild next week. When my darling daughter saw the work in progress, she laid claim to it as a gift for her fellow nursing student from Zimbabwe. Poor Mary has no family here and has not been home for several years. Katie is hoping that this will give her a reminder of home and also a reminder that she has friends here who love her and sympathize with homesick feelings. I made the piece up into a shopping bag or tote bag for her which I hope she will like. The inside of the bag is lined with some colourful batik cotton which gives it a pop of colour and fun. I have to say I used a wonderful tutorial I found online which makes assembly of bags, including Christmas gift bags, so easy! This tutorial from So Sew Easy is a real gem! Very handy at this time or year so check it out! It was a good mail day on Friday! I received two Christmas ornaments in the mail. This cute embroidered felt one is from the EAC ornament swap. It is an original design by the maker and just so cute with it's little scarf and the touches of embroidery! This second ornament is from my friend, Bunny, and just beautiful! It is made with black Dupioni silk, elaborate yet subtle embroidery and beads. The photos had to be a bit washed out in colour for the stitching to be visable in them but it is a lovely black with the purple beads really setting it off - the colour of the beads just pops. Thank you to both these stitchers for their generous gift of their creativity and stitching. Two more beauties for my Christmas tree this year! I offered to do a block for the quilt being made by CQI representing all the countries where they have members. I was given a block put together by Gerry H for Ecuador that already had several seam treatments on it from the ladies at the last retreat. So, I was off to a good start before I even put in a stitch, as you can see above. It has been awhile since I did any crazy quilting and I know very little about Ecuador (although I know more now than I did before I started researching!) so I thought I would share a play by play on this one to help keep me motivated to continue moving forward on it. The first thing I did is go looking for images of the Ecuadorian flag and I found one of it in a heart shape. I printed it out on silk and appliqued it to a small section of the block and then outlined it in three rows of chain stitch, one in each of the main colours of the flag - simple but an okay start. Can you believe it? Another Ornament! Saturday was a fun day for me! Calgary Guild of Needle & Fibre Arts reinstated their past habit of holding a Christmas Workshop - a whole day of mini-workshops free to all the guild members. One of the projects taught was by Freda of Freda's Fancy Stitching and was this Christmas Ornament. I love the elegance of the gold and ivory together and as you can see, mine is completed now! I will be sending this off in the Virtual Threads EAC cyber chapter ornament swap and now I'll get to make another for myself. Another Christmas ornament done! This one was a meeting program at The Calgary Guild of Needle & Fibre Arts. We started during the October meeting and finished them up this month. Freda Murfin or Freda's Fancy Stitching is a guild member and she graciously donated her time to teach us. It is hard to get a photo that shows the stitching and beads properly - it's so sparkly! This is the best I could do at toning down the sparkle. Lots of fun to make! I love rescuing bits of stitching from the thrift stores - my latest find was a really lovely petit point rose. Another thing I am always on the look out for on my treasure hunts are wooden boxes that can be used to showcase these bits of beauty. This photo box was just what I needed for the petit point rose! It was a simple matter to take the box top apart and insert a bit of bridal satin for a backing and then the petit point. The result is what I hope will be a welcome gift for a friend for her birthday. I had some fun making another project to teach at the zipper fun mini workshop at the Calgary Guild of Needle & Fibre Art's upcoming Christmas Workshop day a week from now. This one is a rose brooch and could although this one is done up as a pin, it could also make a fun embellishment for other uses. I think that a grouping of them would look good on a purse. It must be getting close to Christmas - this is three Christmas project posts in a row! This is a little zipper and bead Christmas tree ornament I will be teaching as one of the free mini workshops for the Calgary Guild of Needle and Fibre Arts this month There are quite a few tutorials for these online but they all seem to involve a glue gun./ Instead I used a large tapestry needle and perle cotton to hold mine together. Either way, they are cute and fun to make! Since my daughter has been living a vegan lifestyle the last two years, I have learned a lot about the many sacrifices she makes to stick to it. One of these has been giving up her beloved advent calendar of chocolate goodies every year. So, this year I promised myself I would do something about that! I made this Icy Crystal Advent Calendar using a wonderful freebie from Mr. Printables. My colour ink cartridge was almost empty so I didn't get a good printing of the lovely pink, mauve and blue highlights on the crystals but I am happy with them the way they are and I think she will be too. I hope so since it took me the better part of three days to cut these, fold them and assemble them all together. Each little crystal is numbered and I have filled them with vegan goodies: vegan butterscotch, dark chocolate hard candies, candied ginger, pistachios, macadamia nuts and other goodies - little treats a starving student doesn't buy for herself. I hope that she will open each one knowing how much we miss her now she is away at school. EAC is having another Winter Ornament Exchange this year so of course I have to take part - just can't miss out on anything so fun! Calgary Guild of Needle & Fibre Arts is hosting the exchange this year so we will get to see lots of the ornaments in person. I picked up a Susan Portra kit at the thrift store awhile back and worked it up but got stalled on the finishing (of course!). With the mailing deadline this week, I finally got motivated. I used a bit of cardboard in the center to give it some oomph and then used buttonhole stitch to attach a blue wool felt backing to the canvas. It turned out quite well and I am pleased with it. Canvaswork is not something I have done a lot of and it was great fun! I occasionally find an issue of Inspirations magazine and always pick them up to fill in the gaps in my collection. This time it was Issue #3 - not an easy one to find! My friend picked up an odd looking ball of fabric for me at the salvage center and I am so happy she did - a collection of silkies all stitched together with insertion stitches. This is a little scissor fob I made for a recent exchange on EAC Virtual Threads. For inspiration I took a couple skeins of Madeira metallic floss that came in one of those freebie packages attached to a magazine. I had been looking at some of pincushions made in this shape of three equal squares sewn together biscornu style to create a three dimensional triangular shape. The two combined became this little scissor fob I have sent off to Marie. This is the scissor fob I received back from Marie - gorgeous! I love the original design and the innovative techniques she used. Now I just need to decide which of my scissors deserves to be adorned by this beauty. Have you ever noticed how some farmer's markets seem to evolve into something really special? Millarville Market is one of those! An easy drive from Calgary, and a wonderful array of handmade arts, crafts, food and produce make it a wonderful outing for a Saturday in the summer months. I recently spent a Saturday morning at the Market and found myself wondering why I had taken so long between trips there. So much to see and so many wonderful samples to munch on. My friend and I didn't need lunch after eating samples of all the fruit, baking, bruschetta and so much more. It all makes the $3.00 parking charge to get in a real bargain! I got so inspired by everything I saw there and would love to someday sell at this market! 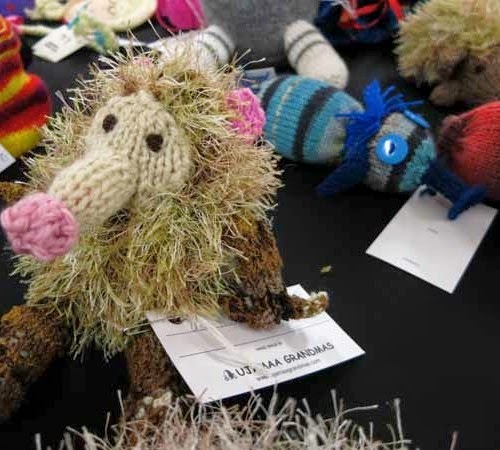 Multitudes of hand-dyed yarns, sock monkeys, live music and so much more - what more could you ask for? Ukamaa Grandmas Sale coming up! 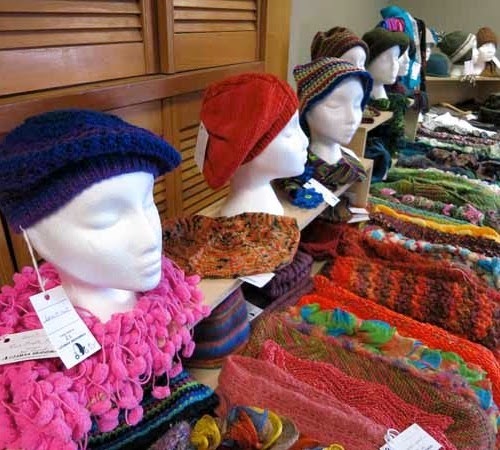 Remember awhile back I posted about the hugh stash sale put on by Ujamaa Grandmas? Well, there next sale - this one of finished items - is coming up. Just in time for Christmas shopping! These are just a few of the type of items you can expect to see at the Bags, Babies & Beyond Sale! Here are the when & where information. If you are in the Calgary area be sure not to miss this one! I picked up a recliner chair for The Vegan Princess, my favourite Starving Student, at an auction for $10 - cheap because of this tear in the upholstery. I sewed up the hole, stitched on some doilies and voila! I didn't care for it with the two bottom doilies added but The Vegan Princess liked it so I left them there. I am taking part in a Scissor Fob Swap on EAC Virtual Threads and this arrived in the mail from Betty this week. Please be sure to click on it to see it closer - it is really lovely and an original design from Betty. I love it! Thanks Betty! And look, I had a little pair of mauve embroidery scissors already - don't they make the perfect pair? !